Hortus Camdenensis | Doronicum caucasicum M.Bieb. 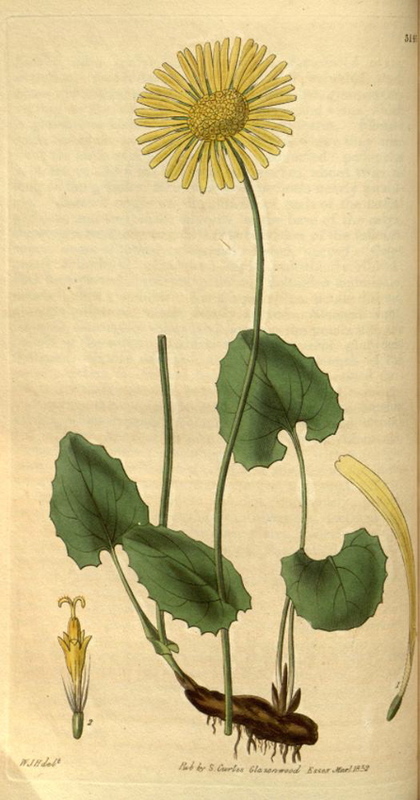 A rhizomatous herbaceous perennial with toothed, kidney-shaped basal leaves, a few lance-shaped stem leaves and solitary yellow, daisy-like flower heads, about 5cm across. To 60cm. Improved garden forms exist, such as magnificum, with larger flower heads. [RHSE, Hortus]. ‘Introduced to our gardens by Dr. Fischer of St. Petersburg. It succeeds with us in the open air, and flowers in April.’ [BM t.3143/1832]. Introduced to Britain in 1815. [PD]. Probably short-lived in the gardens as it is only listed in the 1843 catalogue. Doronicum caucasicum Vis. (1842) = D. columnae Ten., synonyms D. cordatum Sch.Bip., D. cordifolium Sternb. Europe and Asia. A clump-forming perennial similar in appearance to Doronicum caucasicum M.Bieb. but with larger flowers. To 12cm. The date of description of this plant makes it an unlikely identification.